I asked the audience to help to bind my body on two systematized skateboard outfits. 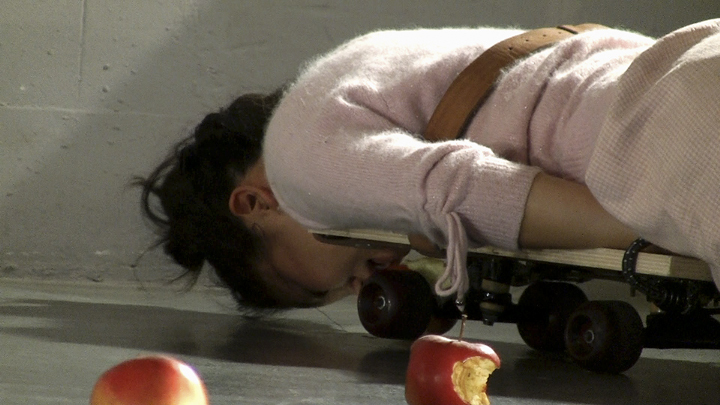 I crawled and ate about fifty apples in six days over the eight performances. Each day, I ate only the fresh apples until my stomach was satisfied and exhausted. This attempt is to explore the tension of the body to sate its appetites and to examine the motivation to achieve. Bitten apples were remained on the floor after each performances until the last day. Thus the viewers were welcomed to see time-scape that those bitten apples on the floor naturally created, when the performance was not taken.